Since we are settled into the campground, there is time to take care of little things. As when we were full-timing, we have to do various jobs as we travel because it doesn’t pay to let them accumulate until the end of the trip. Eleanor has been re-packing some of the provisions that she didn’t have time to deal with before we left Tucson, which means the big pile of stuff in the bedroom is slowly disappearing into the cabinets (or being consumed). We discovered on Tuesday that our shower is leaking at the corner where the wall meets the shower pan, just below the faucet. This is a routine job. It needs fresh caulk. I had done the other major leak point over the winter, but didn’t think this spot needed service yet. Digging around my bin of repair supplies in the back, I found a tube of white silicone caulk that I keep specifically for this job. Unfortunately, it was a previously opened tube that (despite careful re-sealing) had fully cured in the tube since the last time I used it, probably a year or two ago. We’ll have to come up with a temporary seal (likely a strip of tape) for the shower, and buy some fresh caulk at a hardware store on the way to Ohio. Today’s plan was to seek out some of the many waterfalls in the park. This is a huge park, so we focused on those along the northern edge of the park by the Little River. A couple can be seen from the road with no hiking. 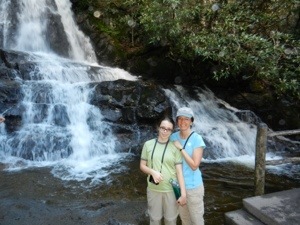 We picked out two roadside falls and two that required 2.5 mile hikes (roundtrip). I can’t say enough about the scenic beauty of this place, but it is sadly complemented by massive crowds almost everywhere. The parking lots were overflowing at every trailhead we visited, despite being mid-week and theoretically not yet in the peak season. We abandoned plans to hike one trail after seeing the hordes at the parking lot, and tried it again at 5:30 pm when things had quieted down. Even a mile into the woods on a muddy trail there was nothing approaching solitude. Normally I find hiking in the woods to be relaxing but this felt more like we had gotten off the tour bus. Getting to two of the waterfalls on our list required us to break my earlier commitment not to leave the park, because it’s necessary to exit through downtown Gatlinburg to reach the “Motor Trail.” This is a horrifying shock if you have been camped in the forest of a few days. In seconds you go from dense green forest to a crowded and visually noxious tourist center, filled with every food chain imaginable, Ripley’s Believe It Or Not, ersatz fashion outlets, and (oddly enough) multiple pancake restaurants, all stacked up against each other in a mish-mash example of urban planning gone amok. Eight stoplights of this before you can make a right turn and escape back into the woods. So that’s where all the day-trippers are coming from. I had no idea, but now that I do I feel like retreating further into the woods. Despite the crowds, we did manage to finally complete our four waterfalls, hiking a total of about 5.5 miles for the day and amazingly not encountering any thunderstorms. The day’s drive totaled 73 miles, more than I would have preferred but every inch of it scenic and astonishing (even Gatlinburg, in its own way). We returned to the Airstream around 7 p.m.to find that I had missed the fact that the center roof vent was open. A splatter pattern on the new vinyl floor showed that a rainshower had come through while we were gone; fortunately, not a flood and no damage done. The good news here was that the rain had kept the camp “fires” at bay, so the smoke level was low for a chance and we could open up the windows to let in some cool air. It is nice to smell the sweetness of the pines and the delicate odor of moss, if only for a moment. And finally, because the Gatlinburg restaurants had planted a seed in our brains, we made pancakes on the stove with blackberries and maple syrup, and wrapped up the evening with a couple of games on the iPad. As expected, traveling into the Great Smoky Mtns National Park meant total isolation from wireless communications. Once in a while that’s a good thing, because for about 360 days a year I’m tied into email and phone. It’s nice to be unreachable for a while. For those who can’t bear the thought, I will only hint that if you electronically sniff around certain buildings you will find open wifi. For the record, I am not admitting that I checked my email at any point during this trip. 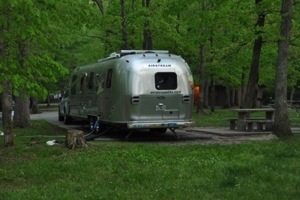 We set the Airstream down in the Cades Cove campground, which is sheltered by a mountain ridge so that outside influences are beyond view or detection by our technology. There are no buildings, antennas, city lights, or clearings to be seen from the campground; we are in a bowl of greenery which is only reached by occasional thunderstorms and light breezes. It was a tight fit into the campsite, even though the ReserveAmerica site touted it as being suitable for 35-foot RVs. If you actually put a 35-foot anything in the site, you’d have no place for a vehicle. Our 30-foot Airstream fills the space to the extent that the Mercedes must be parked sideways. But the real trick was backing into the site. The recently-repaved campground roads are single-lane width, and turning radii are challenging to put it mildly. It took us three or four separate maneuvers to get the Airstream into the space, working around trees, stones, and other obstacles, and we’re not exactly beginners at this sort of thing. 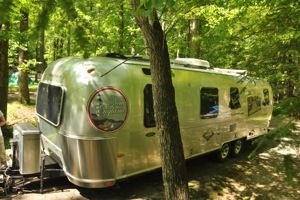 I may have to make a couple of passes to get the Airstream back out, later. This park is one of the big ones, and reputedly the most visited national park in the US park system. I can believe that. While it’s not peak season now, there are a lot of day visitors milling around everywhere and occasionally the roads feel like they are overcrowded. This feeling is exacerbated by the narrowness of the roads, typically lacking shoulders and sometimes one-way. The park service seems to have striven to keep some of the feeling of old times, by avoiding the temptation to turn all the roads into 4 lane highways. Between the campground and the roads, everything feels a bit tight. I’m not complaining, just observing. So far there have been no surprises, good or bad. We had expected a deeply forested, quiet, and pleasant campground in Cades Cove, and we have that. We expected daily thunderstorms, dense humidity, historic buildings, and lots of wildlife, and we have all of those. The campfires smouldering at every third or fourth site are pretty much as expected, too, alas. Yesterday when we arrived the Airstream had gotten pretty warm in the sun, so we opened the windows and ran all the fans to try to cool it. We were not making much progress on cooling it, but we were filling it with smoke pretty well, until a massive thunderstorm barreled through. Soon the outside temperature was 64 degrees, hail the size of cherrystones was bouncing off the roof, and all the fires were neatly quenched, which gave us a chance to air out the trailer with cool evening air before the fires started up again. The sun is another outside influence that barely reaches us. The tree cover is nearly 100%, so our solar gain each day has been negligible. No problem, we expected this and there’s really no need to use much power anyway, since we have no Internet, and no need for furnace this time of year. Our first night we splurged by watching a DVD on one of the laptops (plugged into the inverter, which means it was running off the house battery) and it cost us about 12% of our total power reserve. We won’t be doing that again on this trip. For blogging purposes, I am testing the iPad with a keyboard. This is working well. It’s not as convenient in some ways as the laptop, but the iPad has the enormous advantage of using hardly any power, and being easily recharged from a 12-volt socket. I definitely recommend it as a boondocking-friendly appliance, along with the optional digital camera adapter sold by Apple, and a commonplace 12 volt USB plug. Having just driven 1,800 miles in five days, we really wanted to do just about anything today other than sit in the car. Alas, most of the attractions of this park do require some driving, but we kept it down to less than 12 miles all day by doing the Cades Cove scenic loop and browsing various historic buildings from the settlement days. Although the buildings (churches, cabins, a mill, etc) get a lot of attention, it was interesting to note all the wildlife. 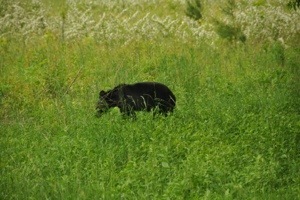 We spotted a black bear, two deer, wild turkey, a large salamander, a snake, and many butterflies. All of the mammals were seemingly unafraid of the gaggles of humans hanging around and taking pictures, which is something we’ve noticed before in national parks where generations of animals have been completely protected from human molestation. Otherwise, we have done very little. A game of Monopoly on the iPad in the evening, a walk around the campground, reading—all camping-type things. Nothing “exciting.” We haven’t bought any t-shirts or ridden the rides at Dollywood down in Pigeon Forge. In fact, we have no plans to depart the park until we leave for good on Friday. It hasn’t been any joy spending day after day in the car, but at least at the end of each day we’ve found a nice spot to spend the night. Last night’s stay in Forrest City TN was surprisingly quiet considering that the little Delta Ridge RV Park was close to I-40. It was the first non-state park night we’ve spent on this trip so far. Normally we are reluctant to stay in the type of RV park that caters to overnighters because they tend to be scuzzy, but this one was just fine. Today’s stop is really wonderful, in a different way. We are in central Tennessee, at the Cumberland Mountains State Park, about six miles south of I-40. This is a large, landscaped, historic, and quiet place with lots of old school amenities, like a restaurant and shady campsites among the trees. As usual, we didn’t book in advance. It’s Monday and not a holiday weekend, so we know our chances of getting in are excellent. We arrived after 6 PM and the office was closed, but the campground host was happy to direct us to a primo space just vacated by his cousin, level, long, and with full hookups. We don’t really need full hookups but it will be nice to wash the reluctant teenager and get everything else cleaned up too. Tomorrow we move to a campsite with no hookups at all. That’s Great Smoky Mountains National Park I’m talking about. I did go to the effort of reserving our site there, because the campground seems popular. We’re getting a zero-hookup site because that’s all they offer. That’s OK for three nights with careful conservation of water and electricity. Normally electricity wouldn’t be a concern at all but all of the sites are shady so we may not generate much power from the solar panels. I have no idea what to expect for cellular connectivity, so if the blog suddenly goes quiet you can assume it’s a lack of signal rather than a sign we’ve been eaten by bears. It should be a good test of the new cellular booster and antenna, at least. One other thing makes this stop wonderful. We are going to have a short drive tomorrow (about 120 miles) and then spend three nights just relaxing. It’s about time. We’ve covered about 1,800 miles so far, in a short period of time. Starting Tuesday afternoon we get to slow down and reinvigorate before plunging into the craziness that is Alumapalooza. The long days of driving are already taking a toll on us. It’s not fun spending all day in the car, and as Emma grows into a teenager she is finding the car rides less agreeable. When she was younger we could drop her in the backseat with a few books and not hear a peep for hours. Now she has a Nintendo DS, several books, a bag of snacks, an iPod, and a slew of other distractions, and she’s bored. I am thinking that we should make some effort to avoid having to do this rush-rush drive next year, by leaving earlier. It won’t be easy because of our schedules, but the alternative is slow torture by concrete Interstate. Perhaps because of our lack of motivation to do the same thing today that we did yesterday,we got a late start this morning. I woke up at 4:00 for some reason, did a little bit of work on the computer, then went back to bed. We slept until nearly 9, and with a little puttering around and a walk around the campground loops, we managed to not depart Lake Bob Sandlin until noon. This meant a shorter drive day, which was fine with me. Now, we have serious doubts about that. I’ve seen Ben Hur and I’m pretty sure the Romans used wooden wheels. Eleanor also reflected on the sign we saw yesterday (“Hell is hot”), noting in the 88-degree temperatures of the morning, “at least it’s not humid!” The thermometer says it’s 10-15 degrees cooler than it was in west Texas, but it certainly feels worse. We have left the desert far behind and I miss it. The highlight of the drive today was on I-40 somewhere east of Little Rock, where we encountered a 12 mile “construction zone” in which exactly 0.3 miles were actually under active construction. Traffic was weird; stopped dead for 10-15 minutes, then roaring ahead at highway speeds. We went through this for nearly an hour and then finally traffic broke free for a few miles. But we weren’t out of it. I was about a tenth of a mile behind the next car, fortunately, because traffic suddenly came to a screeching halt just over the crest of a small bridge. I had to lock ’em up, all four trailer tires smoking. With no breakdown lane at that point andthe left lane blocked off by large orange traffic barrels, my avoidance options were poor. For a few seconds it looked like we were going to plow into the back of the stopped Toyota Highlander in front of us. At the last second I swerved between the orange barrels like a slalom course, as a gambit to buy a little more stopping room. That bought us a few feet only, because just ahead the construction crew had left a few Jersey barriers. But we stopped in time and all was well. I was impressed that the Airstream handled so well. We’ve spent years tweaking it for just such a circumstance, with disc brakes, the Hensley hitch, and the Michelin tires, but still you never know until the pressure is on. It was nice to feel the rig perform exactly as it should have. It stopped quickly, there was no “Hensley bump” or push from the trailer (which is typically caused by having the brake controller set too low), and at no point did I lose control of the vehicle. It steered right where I wanted even under severe circumstances. So the incident turned out to be nothing but a little smoke. This whole incident was a little ironic since you know I was bloviating a couple of weeks ago about the importance of having your weight distribution correct because “someday it will matter.” For us, “someday” turned out to be today. Of course, it’s really about more than just the weight. Brakes, tires, hitch, and tow vehicle all enter into the equation. For example, I am certain that without disc brakes on the Airstream and an excellent brake actuator we would have had a front-end collision today. I stopped at the next exit and checked all the tires carefully, but there was no sign of damage. For the next 25 miles I was a little jumpy about the cars that cut in front of us (a frequent occurrence along I-40) and any hint of vibration from the tires. Even though I can’t see anything wrong with the tires, there may be hidden damage so I’ll be watching them carefully as we continue down the road. We finally bailed out around 6:30 in Forrest City, AR at a little 18-site campground. Full hookups for $20, and it’s actually a decent spot for an overnight. It looks like we’ll get into Tennessee tomorrow and hit the Smokies sometime Tuesday. One last big push tomorrow and that should be the end of the big mileage days. 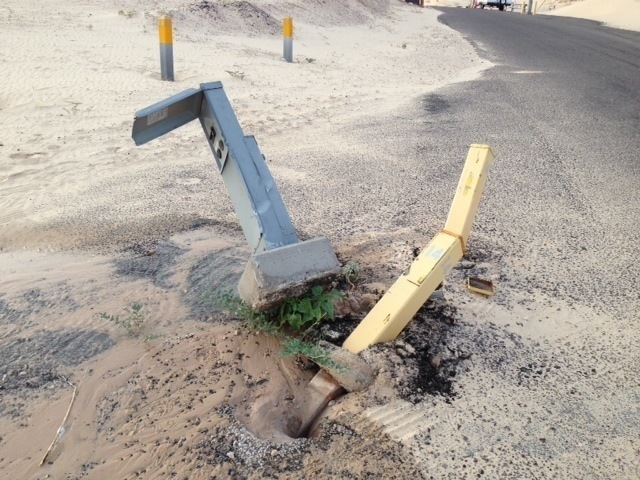 Last night as we walked through the Monahans Sand Hills State Park we found that after we arrived somebody had clipped one of the campsite utility pedestals and broken open the water line. Water was gushing from the ground. It didn’t take a rocket scientist to compute that soon the park staff would show up and turn off the water to the entire park. This turned out to be true, a couple of hours later, but fortunately Eleanor had already filled the fresh water tank, so we weren’t inconvenienced. The folks who clipped the pedestal, on the other hand, had a large headache. 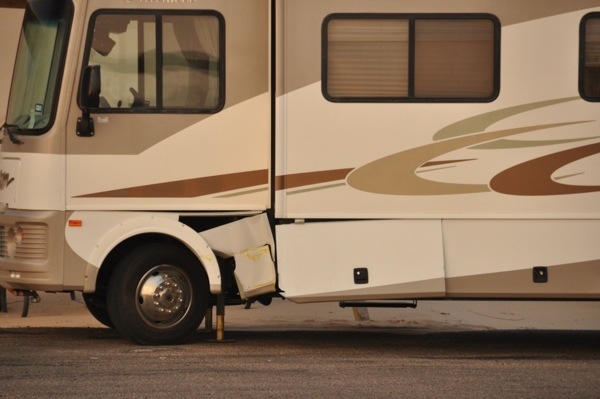 Not only would the state parks department be communicating with their insurance company, but their motorhome had a nasty gash along the front driver’s side storage compartment and slide-out. That bit of inaccurate driving is going to cost a chunk. But at least they were responsible about it: they called the park staff to report the accident. Our original thought was to just drive 420 miles and crash for the night in a Cracker Barrel parking lot, but when we got there I was still feeling OK to drive further, and it was still 92 degrees. We decided we’d rather spend the night in a pleasant Texas state park with power to run the air conditioner, than boondocking in a parking lot by the highway. Lake Bob Sandlin State Park was 80 miles further down the road, and we made that our destination. This turned out to be a great move. The state park is forested and green, with widely spaced campsites in three loops, and it feels very pleasant. I definitely can’t complain about the 30-amp power either, as it has already turned the Airstream from an Easy-Bake Oven into a comfortable hotel room. But the big win was Vaughan’s. As we were driving in here I was thinking about another trip through East Texas along I-20, where we discovered a great catfish place. I was thinking, “This is catfish country,” and (note that here I’m giving you a fresh insight into my personal foibles) I really like catfish. 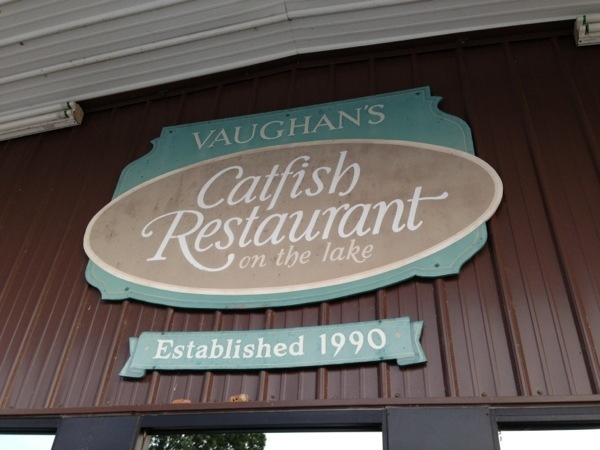 As we pulled off I-30 and began the 12 mile drive to Lake Bob Sandlin, I mentioned to Eleanor that the one thing that could make the day end perfectly would be discovering a nice little catfish restaurant. And just 0.2 miles from the entrance to the state park, there it was. If there was ever a sign from the heavens that I’ve done something right in my life, this was it. After nine hours of drive time, nothing could look better to me that that sign. We found a site in the campground quickly, unhitched in record time, and zipped over to Vaughan’s for what turned out to be a fun meal. This place is one of those little “finds” that we like. Local, unique, and good. The restaurant is almost devoid of interior decor (think college cafeteria with two big screens showing Major League Baseball) but that just shows that the management knows they have good food. No pretense, just solid meals served family-style, friendly service, and a spectacular view of the sunset over Lake Bob Sandlin. We liked it. The catfish definitely hit the spot for me, with sides of beans, hush puppies, coleslaw, pickled green tomatoes, and a slice of coconut meringue pie for dessert. Now I don’t feel like I just towed a trailer 500 miles. Our plan for tomorrow is pretty much the same as the plan for today. This is a slog right now. We’ll probably try to cover another 400 miles and get into Tennessee somewhere along I-40, then hit the Smokies by Monday afternoon. At that point we can slow down for a few days, to chill out a bit (and get some work done) before we launch into Ohio for the pre-Alumapalooza prep work.